ORDER NOW AND GET AT LEAST 10% OFF AND FREE US SHIPPING! We except online payments exclusively through Paypal, you can use your major credit card and you do NOT need to sign up with them. For credit card orders over the phone call 1-888-DOG-JAKE (364-5253) and Sunny will take care of you. 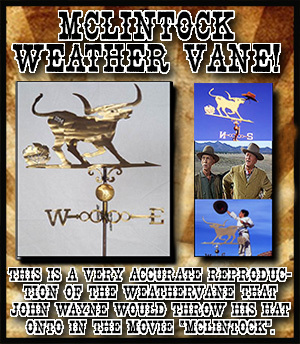 McLintock Western Weather Vane BACK IN STOCK! Fifty years ago a landmark western comedy movie, “McLintock” starring John Wayne, was released. Opening scenes and the closing scene featured what has since become the most famous western weather vane in history. John Wayne’s character, G. W. McLintock would come home drunk every night and throw his hat onto the weather vane which was located on the dormer end of the three story house. Since the weather vane was installed in the original location, two others have been donated for charitable uses. One fund raising auction was for the John Wayne Birthplace Museum in Winterset, Iowa. This was to be the last public appearance of Maureen O’Hara. The Auctioneer was Aissa Wayne and we are very pleased to announce that the auction sale brought $1500. 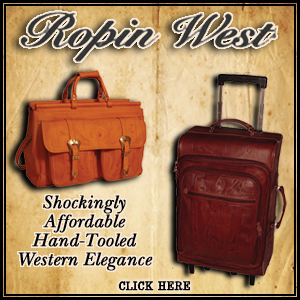 The Ropin’ West collection of hand-tooled Western luggage and briefcases will express to the world your Western individuality and style. Whether you’re entering a meeting or boarding a plane, you’ll be bringing a distinctive piece of the West with one of these exquisite examples of function, styling and panache. All feature quality workmanship, and all Ropin’ West pieces come with a one year warranty. And with Free Shipping, you’ll find our prices are far superior to the competition. 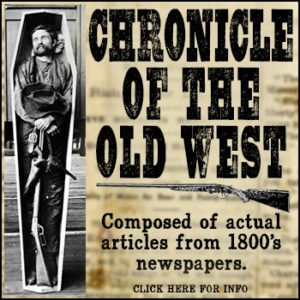 Westward Ho – Classic Western China! Westward HO Rodeo Pattern china was originally made by the Wallace China Company in Los Angeles, USA between 1943 and 1964. The Wallace company also made other western patterns: El Rancho, “Boots & Saddle” (Now Available again for the first time in years! ), Chuck Wagon, Longhorn and others but the Westward HO Rodeo pattern was the most popular china made by the Wallace company. If your lucky enough to own originals, the original heavy roll rim design and colors on these reproductions are so accurate you can mix it with your earlier china to fill out your collection or replace broken pieces. We are proud to help carry on the tradition of Bronco Sue Western Hats. Their classic hats include Bound Edges, Pencil Rolls, Whipstitching, Wide Brims, Tall Crowns, & Special Bands, and are available in 8x, 20x and 100x. Sizes are from 6 1/4 to 8 3/8, and they can do over 40 colors – call for Pricing and Availability.